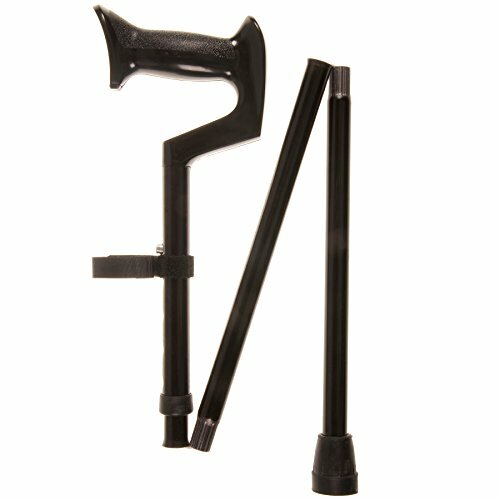 PCP brand orthopedic handle cane. Helps provide support while walking, and reduces stress on the injured limb. It is usually held in the hand opposite the injured limb. The ergonomically designed handle provides comfortable support and distributes the weight of the body directly down the shaft. It provides a large, comfortable grip, which may be easier for some individuals with limited use of their hands. This type of cane is for those who require only a minimum of support and stability. Molded ergonomic handle evenly distributes body weight, reduces stress on user's hands and joints. Fabricated using strong extruded aluminum tubing: 7/8" (2.2 cm) diameter shaft, 3/4" (1.9 cm) diameter leg extension with slip resistant rubber tip. Handle height adjusts from 35" to 39" (89 - 99 cm). Weight capacity: 300 lbs. One button height adjustment with silencer ring. Easily collapses into three sections to fit into small spaces. Folded dimensions: 14" x 5" x 2" (35.5 cm x 12.7 cm x 5 cm). Made in the USA. If you have any questions about this product by PCP, contact us by completing and submitting the form below. If you are looking for a specif part number, please include it with your message.